As for the church age being over (or not), I found an interesting excerpt in one of T.A. Sparks’s articles where he reflected upon God’s pending judgment which always ends one specific age by bringing in its wake destruction and chaos before the new age begins. The last call of God, as judgment is pending, is a call to Himself. Here then is the call of God in our time. The last movement of the people of God is to Himself: not to a movement as such; not to a teaching or interpretation of truth; not to a sect or party; not to an enterprise or mission – but to Christ. The final true and Divine movement is to the Lord Himself. The sheer pressure of the conditions in the gathering storm and tempest will demand a leaving of all lesser interests and objects, however good a purpose they may have served hitherto, and a moving toward the Lord Himself. ‘Things’ divide; the Lord unites. ‘Things’ must pass; the Lord abides. The time comes when all the means and accessories which the Lord has sovereignly used will cease to avail. This includes all the organized side of Christianity, and the Lord will force the issue as to how much there really is of Himself. Did we not observe that the mainline churches have become deserts because they are falling apart due to more and more revealed scandals? Is that not a sign that many churches – not all, perhaps – have not been focused on Jesus Christ but merely on this-worldly things and on how to keep the “system” going? I have found it easier to seek GOD on my own that is for sure. Fred, don’t forget that, “…he that comes to God must believe that he is, and that he is a rewarder of them that diligently seek him.” (Heb 11:6, KJ2000). You are a blessing, dear brother! Someone pointed out that God does not tell time in hours, days, or even years like we do, but in epics or dispensations if you will. One age lasted from the fall of man to the flood, the next one was from the flood to Moses and the age of the law. That age came to a close 2000 years ago on the Day of Pentecost when God poured out His Spirit on all flesh (Joel ch 2), not just an appointed few as in the Old Covenant. With all this in mind, think of how traumatic it was at the end of each of these ages… a world ending flood, Egypt all but destroyed, the destruction of the temple and Israel as a nation and the Jewish worship and sacrificial system, etc. What do you think will be the sign of the end of the church age before God ushers in what I believe to be “The Age of the Bride and the Bridegroom”? Won’t it be a complete destruction of this false system built by men around the gospel of Jesus Christ? Take a look at that picture that Susanne felt led to post with this blog! 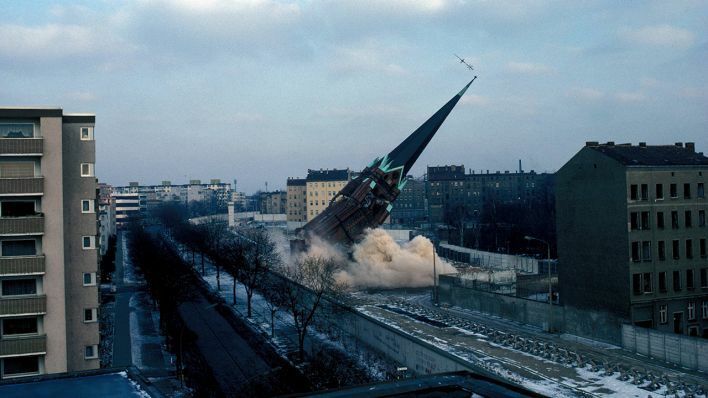 It is a picture of the destruction of “The Church of Reconciliation.” For the past few years all denominational leadership have been striving to bring all their organization into reconciliation in a sort of man made unity and it is failing no matter how many doctrines they do away with to come into agreement with one another. Jesus came not to bring peace but the sword! All man made sects will be divided against one another just as it was at the tower of Babel and Babylon the Great is the end result of the man made religions that have formed around Christianity and God’s judgement is upon it. Why? Because He is ushering in a NEW dispensation! Yes HE is tearing us, we the church! It is not the devil or ISIS or communism or anything else. These man made temples that Christendom is so focused on are coming to an end along with the political systems that support them. Nowhere in the Bible did Jesus command the apostles to go forth and build churches so Christians would have a place to worship! Quite the opposite! He pronounced that all worship would no longer be in holy places, but true worship of His Father would be in the Spirit and in Verity, truth in our inward parts, our hearts. He also said that the temple system would be torn down and that HIS temple would be made of LIVING stones, the very hearts of the true worshipers! So, all that said, AFTER two days (2000 years) of Him taring us, HE will heal us and bind up our wounds. AND in the third day, not at the end of it, HE will raise us up THAT WE MAY DWELL IN HIS SIGHT! Jesus is coming back for His perfect bride, not a divided and self-destructive church system that is so focused on its own greatness that it can not see Him coming! Look up, dear saints of God who truly love the Son for your redemption draw nigh! You’re very welcome, Michael. Thank you for having inspired me yesterday to write this small post of mine. Thank you, Michael. I am so grateful, too, to have come to know you and to experience more and more depths of the Spirit together with you. Becky, this might sound harsh, but what you have and what the church going crowd does (from their lack) are like comparing being married to and living with the one you love versus going once a week to be intimate with them at the local brothel. You have chosen wisely with your heart dear friend. As for Hebrews 10:25 which they threw in your face to validate the shallowness of their relationship in Christ, you might want to read a study I did on this verse and its REAL meaning. The one unique thought about assemblies, came through my experience as a (former) Quality Control guy for the aerospace industry. One of the Military Standards most familiar to us QC guys, is Mil-Std-130 which governs part marking. Believe it or not, Mil-Std-130 defines the word “assembly” the key of which is that an assembly is a group of individual parts “joined together to perform a specific function”. So, what “function” is the assembly of the brethren to accomplish? 1st Corinthians 14:26-33 is a good place to start. So when the paid professional hireling usurps all the functions of the assembly entirely to himself, is it a functioning assembly? Like most every other accusation from the pulp-it, its the accuser who is most often guilty of the accusation. In the sense of fully functioning, the Sunday morning religious theater is NOT a Biblical assembly. Thank you very much for the pingback to my blog, Michael. One of the most unsettling things I’ve done to examine my beliefs, is to compare the 4 books of the gospel, with the rest of the new testament. Take the word “church” for example; Jesus used it just 3 times (Matthew 16:18 and 18:17), whereas it is used 113 times in Acts through Revelation (KJV translation). The Greek word “ekklesia”, which translators have rendered “church”, actually means “assembly”, yet it is translated “assembly” just 3 times: in Acts 19:32, 19:39 and 19:41. That passage refers to a civic gathering of the Ephesians to address the threat The Way posed to their profitable business of making and selling silver shrines of the idol Artemis (Diana). About whether Jesus even used the word “ekklesia” (church), consider whether He would have spoken Greek, the language of Rome, Israel’s oppressors, or would Jesus have spoken Aramaic, the regional dialect at the time, or Hebrew, the sacred language of God’s people? Matthew 16:18 is such a solemn moment in Jesus’ earthly ministry, it’s difficult to imagine Him speaking any language other than Hebrew in front of the 12. Personally, I think putting the word “church” into Jesus’ mouth is not honest of the translators. And for men to undertake “church” building programs, based on Jesus comment “I will build MY church”, is man’s usurpation of Jesus role. Jesus told them to “make disciples”, not “build churches”. And where there is just ONE Lord, ONE body, ONE faith, ONE baptism, the plural of “church”, i.e. “churches”, is a lie in and of itself! So what if Jesus has always been about the work of “assembling” His spiritual temple with us as “living stones” surrendered to Him, while men have chased their tails building physical “churches” which are a kind of Egypt? I suppose what I am getting at, is I no longer believe that the so-called “church age” was ever intended by our Savior, although He has allowed it, while quietly and invisibly He has gone about the work of building HIS spiritual temple and royal priesthood (1 Peter 2:4-9). For years now I have struggled deeply with the verbal expression of my faith in the Messiah, for the simple reason that even our language has been co-opted by the enemy. If I say the word “church”, most everyone thinks of a building which is in direct conflict with scripture (Acts 7:48, 17:24, et al). I left all that years ago to cleave to Messiah! So how can I call myself a “Christian” when I know the Messiah’s name was NOT Christ, NOT Jesus and it was the Roman oppressors in Antioch, who began calling followers of “The Way” by the derisive name “Christians”? I reject all the Romanizations of the faith and follow Messiah alone, which is difficult because even the scriptures which tell us of Messiah are littered with Romanisms. How does a believer even speak of their faith, when the enemy has stolen our language? I hope in my lifetime to see the day that the Lord throws them down, with fire and violence, for obscuring the Truth. Yes, Jack, been there, done that too, that is, comparing the word “church” with “ekklesia”. If I do not feel comfortable with a word in Scripture today, I am more cautious than I was in the past. Only if I find a translation that immediately hits me, I know it was inspired by God. While written to the “church in Laodicea”, upon whose door the Lord is knocking, it is individuals He enters into and sups with, not the the Laodicean church as a whole (or institution). If indeed man’s church is engaged in whoredom, where the Lord says His people are “in her” and He is calling them “out of her” (Revelation 18:4), then to ask the Lord to “come in” is to ask Him to enter into the whore as well. Hence, the Lord remains on the outside looking in and calling His people out unto Himself. Any effort by His people to go into her and reform her, or to “usher in revival”, or any other such nonsense, is futile. There is but one call, and that is to “come out of her, My people”. Anyone who hears otherwise, is listening to their own religious nature. Some years ago, I discovered that I’m directly descended from the Puritans. Doing the research, I also found that they were nothing like the popular stereotype. According to their own diaries (primary source information), they really did have a vibrant sense of humor. They knew how to throw a good party and they were colorful dressers (They may have worn the black and whites on Sundays). What set them apart was that they made no distinction between the sacred and the secular. They did not compartmentalize life. To the Puritans, all of life was sacred. Insofar as possible, they lived every area of life so as to please the Lord and grow in character. They took their faith seriously. Imagine that! Unimaginable! 😉 Have you ever blogged about that, Dr.? I was unable to find anything about that on your website. I’d be interested to read more about it and the source material if you have any references. The note about humor is especially interesting because I’ve often found modern believers afraid to laugh; not that they do not have senses of humor, but because when in religious company, they’re afraid to laugh. In fact, years ago when I submitted a number of humorous original songs to the Christian music industry, one reply said “there is no room for humor in Christian music.” So I took a job in the aerospace industry making bombs and bombers. I remember one time after having a spinal tap and I was spared of a humongous headache for a day and my brother took me to church many years ago. The preacher was preaching and I laughed out loud. I was the only one laughing and my brother just gave me a glare. Then when we left my headache came back! I didn’t go back to that church. In fact I rarely went to church. I hate rituals. I did however go to another church about 10 years ago maybe longer than thatago to a laughing church. I thought I missed a joke. I asked why is everyone laughing? The person that took me said it was the Holy Spirit laughter. And everyone was laughing and some were rolling around on the floor and acting strange and I just didn’t get it. I didn’t go back after that. Well we can all guess who the preacher was. I won’t name him though. I went to another like that when I was actually laughing at the people who were acting strange. And yet another person who took me there glared at me like I was disrespecting what was going on. I just said I had never seen anything like it before. Someone pretending to be a fish? It was funny! Leland Ryken. (1986) Worldly Saints: The Puritans As They Really Were, Zondervan Publishing House. The author is a professor at Wheaton College. He writes very colloquially. I probably highlighted, bracketed, or circled at least 50% of it. Yes, Jack, I quit praying for the Lord to bring revival into that system as well, when He told me, “Michael, do you really think I want to give birth in that system so they can tear my infants in half as they fight over them?” Then He told me, “They are blind guides leading the blind. Leave them alone and let them fall into the ditch.” I know for me, falling into their effluent filled ecclesiastical ditches and lying in them for a while was the only thing that finally got me to quit following men instead of Christ. One further thing about the present situation in the Laodicean church system, you have to remove that chapter break in your thinking and keep on reading John’s letter as it was originally written. The solution for the “any man” that Jesus wins to Himself out of that system in chapter three is no longer a closed door with Jesus locked outside! THAT is over with! The same Jesus that John observed outside that closed door system moved on! John turned and he saw an OPEN DOOR in heaven! Not only that, but he heard Jesus this time talking to him loudly like the voice of a trumpet saying, “COME UP HERE FOR I HAVE THINGS TO SHOW YOU THAT ARE NEXT FOR ALL WHO OBEY MY HEAVENLY CALL!” What did John see? He saw Jesus sitting on His throne in all His glory. My brother, Christ has so much for us to see and experience, but from my own experience I can tell you that we have to quit licking our wounds and worrying about that church mess and follow the sound of HIS voice and obey His upward call, not the horizontal and downward calls of carnal men. God has SO much for us, but we must finally break-off from all that is carnal and grow into all He has for us in the Spirit, but we can’t do that while we are distracted by the things which are earth bound. Thank you, Nancy. Your comment reminds me of someone who called to tell me that they had “felt the Holy Spirit move” in the church I had left the year before. You are absolutely Hilarious Jack! Thanks for being you! Thank you for sharing your personal insights with us on here, Nancy. Susanne, once again you stirred up the Spirit within me to share something from my heart. So many Christians come to Christ and are either unaware that they have NOTHING that God can use without it all passing through His fires of purification (the dark night of the soul and the wilderness) or they are willfully ignorant and use the powers of their flesh and their personal charisma to try and do His work for Him. The trouble is that soon the stinking smell of the flesh and their pride is all over it just like Cane’s sacrifice. God rejects it and they have to spend more and more human effort to prop it up and keep it going. “And Abraham said unto God, ‘O that Ishmael might live before you! '” (Gen 17:18, KJ2000) and God’s answer to the works of the flesh is always the same, “But my covenant will I establish with Isaac,” the miraculous child of God’s promise. Amen, Susanne! While I was an active member of an SBC church, I too was guilty of believing that we were the only ones within our community who remained in truth, and that included all the other SBC churches as well as other denominations. After all, our preacher sure can preach a powerful sermon, not like all the other lukewarm, worldly churches. Oh what arrogance! Again, it was this attitude of “we have need of nothing,” and that is a dangerous deception. Praise God, He showed me otherwise and I have since repented. Yes, God’s purifying fire hurts, but the new growth that follows is for His purpose and glory! A word of caution (to self), we can just as easily become arrogant and prideful having been “called out,” so knowing what we know now, we should have compassion and act in humility towards those who continue to remain in blindness within these buildings. We can warn and be a witness as we are led, but it is, ultimately, the Holy Spirit who will lead them out of “Egypt.” If this is so, they will not return. Yes, indeed, Nancy, I think it is very easy to fall because of pride when someone thinks being called out would make us any “better” than other human beings (esp. those in the churches). We are all the same on the inside unless God saves us and brings forth a new creation with a new heart and a new mind. Susanne, a few posts above included several messages about the Puritans. A number of their prayers were compiled in a book called, Valley of Vision. The book is awesome. Imagine for a moment that heaven is at the ceiling of the room where you are sitting and hell is at floor level. Most ministers today begin preaching halfway in between. They’re more than happy to preach about the glories of heaven, three steps to wisdom, five steps to forgiveness, or seven steps to whatever. However, to grow we need to fully appreciate the magnitude of the gap between good and evil; heaven and hell; and sin and righteousness. From the bottom of the well you can see the stars even in the daytime. The deeper the well, the brighter the stars. On one hand, we don’t need to overdose on the hellfire and brimstone preaching of the early 20th Century; on the other hand, we don’t need to overdose the “Sweet bye and bye” either. We need to hear the wholeness of the gospel message from Eden to heaven. The Bible presents the good, the bad, and the ugly–straight up! We grow to the extent that we fully understand the risks as well as the rewards. What do you think? Lloyd, I believe that we need to know the Person sinned against on a very personal and intimate level and realize the greatness of His love and grace toward us so that we want to root out sin in our own life completely. As for preaching, we need to speak the words God gives us RIGHT NOW. There is no rule or principle to be followed but to listen to His voice every moment (which is anything but easy). I summarized my thoughts on this issue in the following poem. I recall having posted it in a comment on your blog before. I’m sorry Susanne. That was my first experience seeing something like that as I was used to being in a catholic and or more reserved churches. Looking back of course I realize just how demonic it was. And just how demonic that one church was with the “holy laughter”. And it is sad indeed if these people are still falling for it. I am cried out to be honest. When I finally stumbled on the truths I was horrified. Even some dreams left me feeling horrified to be sure. You’re right it isn’t funny but when I first saw that it was funny to me. Just being honest. No prob, Stacey. There were funny moments, indeed. I remember myself playing piano while kneeling on the floor. I could not “see” what I did there, but the outcome was a nice new song, though. 😉 And all were laughing about crazy Susanne kneeling and playing piano for a very long time. Sometimes we even played for hours! 🙂 By the way, the charismatic spirit moved through the Roman Catholic Church as well. May God help them all to seek and find The Truth. Amen. Yes I am aware. I don’t even trust charismatic personalities in which my last husband was. I was crushed. That was a very hard lesson. And not worth talking about. That is why I choose to stay single and the Lord has removed that desire from me anyways. Praise the Lord! Becky, I too have had Hebrews 10:25 thrown in my face, I can’t tell you how many times. Interesting, if these people would continue to read a little further down, they would find that they have taken this verse out of context. Your experience with “church” has actually been a gift and that will become even more clear the longer you are away from it. For those with eyes to see and ears to hear – our Lord Christ Jesus will expose the condition of it. And once our eyes have been opened by the Holy Spirit, you can’t go back in. I actually feel “safer” outside the “camp.” Which brings us back to Susanne’s question, Is the Church Age over? Blessings to you, Becky.